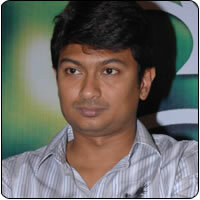 Producer Udayanidhi Stalin is the man with a golden touch. All the films that have been produced by him have turned out to be a grand success. And now, he has ventured as a distributor for Vinnaithaandi Varuvaayaa, which also happens to be a runaway success. Riding high on the success, Udayanidhi also has a film that will have Kamal Haasan, Madhavan and Trisha, which will be directed by KS Ravikumar and another film with Suriya for which Murugadoss will wield the director’s cap. In an interview to a popular Tamil daily, Udayanidhi has confirmed that he is looking for a suitable script to don the greasepaint. Why Bipasha did not make it?